An Indianapolis man has been charged in connection with a traffic collision that left two police officers and himself injured in Lakeview late Thursday. Kyler Diaz, 23, is charged with driving under the influence of alcohol and three traffic violations: disobeying a red light; failure to reduce speed; and reckless driving, police said. He is scheduled to appear in traffic court on June 4. The 19th (Town Hall) Police District said in a tweet on Friday that the driver had an initial blood alcohol content of .205, which is “two-and-a-half times the legal limit,” the district said. CPD POD camera video shows the patrol car stopped for a red light, facing eastbound on Belmont at Ashland around 11:57 p.m. When the officers' signal changes to green, the patrol car enters the intersection. 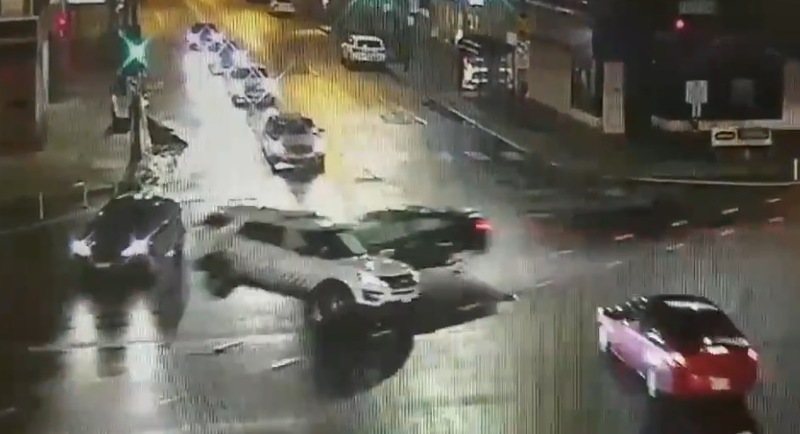 Less than a second later, the vehicle allegedly driven by Diaz runs the southbound red light on Ashland and slams into the side of the police SUV. The impact caused the patrol car to spin nearly 360-degrees and slam into another vehicle that was being driven by a 28-year-old woman. She was not seriously injured. Diaz's Facebook page on Monday listed his hometown as Indianapolis and also said that he currently lives in Chicago. The account has since been deactivated. No mugshot is available for Diaz, according to a CPD spokesperson.